Retro is the new modern! This to me, seems like the sort of thing I would have been talking about way back when I first started out in 1988…except blogs didn’t exist (the internet was unknown then) . Everything was done by letter or telephones with wires!. Back then, what is now known as the Retro Roadshow was state of the art equipment. Real lamps controlled by transistors, which got nice and warm when working behind it. Very little control over what the colours were doing out front, and certainly no pretty hearts or snowflakes on the dance floor like there is today. The smoke back then was made from cigarettes rather than a haze machine! This setup is 30 (and in parts 40) years old. It shouldn’t still be in existence. But it is….because I love it for what it is and what it does. It takes a lot of work each and every year to keep this antique of the disco scene on the road (rewiring is a complete pain). The Retro Roadshow is certainly a labour of love and there are very few “traditional” light shows still on the road these days! It’s coming back into fashion in a big way though! This alone makes me very happy! When I first started work at the tender age of 17 with something smaller but very similar to the Retro Roadshow, this is what you expected to see at any function which had hired a mobile DJ. The word “mobile” in those days was a very loose interpretation by the way. Then as now, the kit weighs in at a metric tonne! It’s a beast of a rig compared to the modern day kit which weighs a mere fraction of this! And add in the sheer weight of the crates of vinyl records…I used to look like Geoff Capes! The Retro Roadshow is becoming popular again for a lot of different reasons. Its actually going out nearly as many times as my modern equipment for weddings and milestone birthdays. 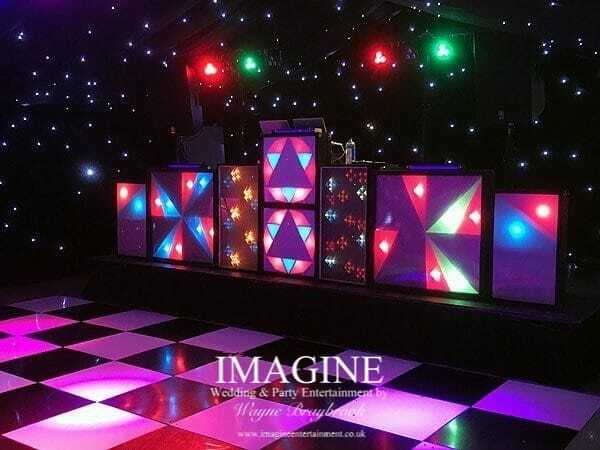 Weddings: because it’s different from what other DJs are offering, and milestone birthdays….well it’s what we of a certain age remember from the school discos of our youth! I recently spoke to a wedding Stylist, Gemma Lander about why the Retro show is becoming so popular for weddings, and her reply surprised me. This beast of bulbs isn’t modern technology. It won’t project a Cadbury Purple flood of light on the dance floor during your first dance (sorry….it’s either red, green, blue or yellow….or a combination of those colours). It doesn’t project LOVE hearts onto the dance floor either – that’s how things were back then! BUT – what the Retro Roadshow DOES provide is something different from what everyone else is using for their party….AND DIFFERENT IS GOOD! For a chat about YOUR wedding disco or party plans, why not get in touch and let's start planning an evening to remember!